Which of these diabetes-focused companies is the better bet for new money today? More than 29 million Americans are currently diagnosed with diabetes. Treating this chronic disease is incredibly expensive. The American Diabetes Association estimates that the annual cost of caring for people with diabetes and prediabetes is $322 billion per year. That's an enormous figure, so perhaps it is no surprise to see that many pharmaceutical companies specialize in treating the disease. With shares of both companies in the dog house, let's take a closer look at each of them to determine which one is the better bet for new money today. The bull thesis for MannKind is all about Afrezza, an inhaled insulin. Millions of people with diabetes require multiple injections of insulin each day in order to keep their blood sugar levels in check. Afrezza provides these patients with a needle-free alternative for their fast-acting insulin needs. While this idea sounds promising, thus far MannKind has struggled to gain market adoption. The company initially partnered with French pharma giant Sanofi (NASDAQ:SNY) to launch Afrezza, but a number of issues caused sales to fall short of expectations. Less than a year into the launch, Sanofi waved the white flag and handed the drug back to MannKind. Understandably, these developments caused the company's shares to tank. Now MannKind has been forced to take on the commercialization challenge on its own. 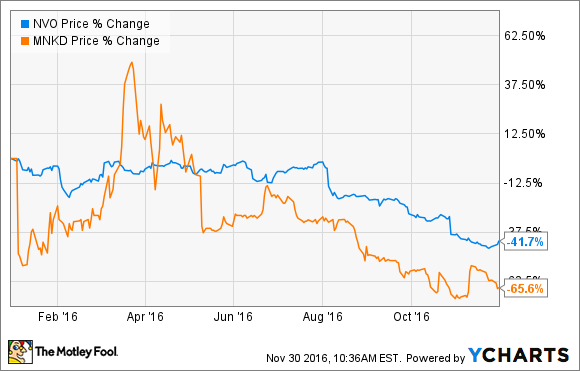 Last quarter, MannKind sold $573,000 worth of Afrezza, which is still a pittance compared to its market potential. While management remains optimistic about Afrezza's potential, they have admitted that many patients are dropping off of the therapy because of cost and efficacy issues. Solving both problems will likely take some time. On the plus side, investors recently got some good news from Sanofi. MannKind announced that Sanofi has agreed to forgive its outstanding loan balance of $71.5 million, will buy $10 million worth of insulin immediately, and will also make an additional cash payment to MannKind of $30 million in January. When this is added to the company's other financing options, management estimates that its cash runway now extends to the third quarter of 2017. That might prove to be enough time for the company to gain traction, raise its share price, and open up new financing options. Novo Nordisk has been a leading provider of products that treat diabetes for decades. For years this company enjoyed a premium valuation for holding a leadership position in this growing disease state, but more recently shares have been heading in reverse. What has caused the decline? Insurance companies have been putting insulin producers like Novo Nordisk under huge pressure to lower their prices in order to remain on their formularies. Novo Nordisk has been forced to offer big discounts on its older insulin products in order to remain competitive, but that pricing pressure is having a big impact on its growth prospects. Through the first nine months of the year, Novo posted sales growth of 6%, but that mostly owed to the strength of its newer drugs like Victoza and Tresiba. Its legacy products are not even treading water, so management was forced to slightly reduce its revenue guidance for the full year. That doesn't sound too bad, but management dropped a big bombshell on shareholders by announcing they would cut their long-term operating profit growth target in half. The company had previously been aiming for annual growth of roughly 10% per year, but it now expects that figure to be just 5%. Investors didn't take the news well. Shares dropped by double digits on the day of the announcement and have continued to drift lower ever since. 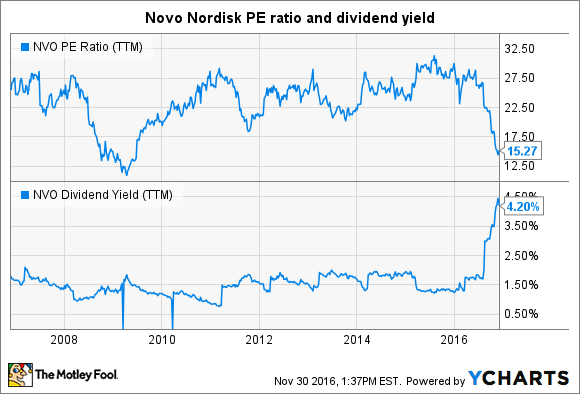 The falling share price has pulled Novo's trailing P/E ratio down to levels that we haven't seen since the Great Recession, and its trailing dividend yield is currently sitting at a 10-year high. NVO PE Ratio (TTM) data by YCharts. While Novo's slowing growth prospects are most certainly a source of concern, it is possible that the worst of the selling is now over. While risk-loving investors might be attracted to MannKind's sub-$1 share price, I can't help but feel that the odds of success are still heavily stacked against it. For that reason, there's no doubt in my mind that Novo Nordisk is the better buy today. The company is highly profitable, is growing, pays a strong dividend, and is trading at a valuation that it hasn't seen in years. While MannKind could be a multi-bagger if everything works out perfectly, the investor in me knows that Novo is the smarter bet.